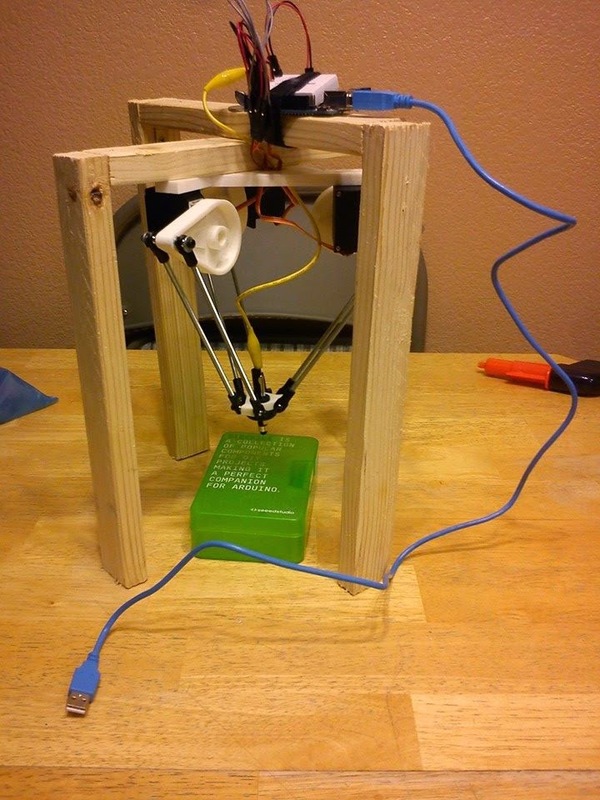 I built a copy of Justin Engler's Delta Bot R2B2. Here's how I did it with a revised parts list. 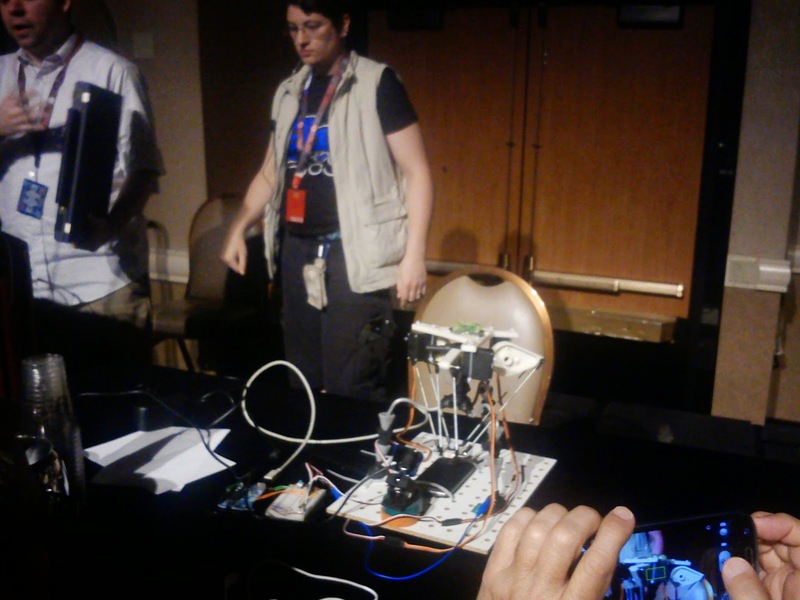 Justin Engler and his iSEC Partners team presented his PIN punching robot at DEF CON 21. Even though it was, by his own admission, a last resort in cracking phone PINs, it received coverage in Forbes and other outlets. The 3D prints from my brother's Replicator came out well. The dimensions were correct overall, but I had to do some filing to get the mounting bracket to slot together. The servos I used required me to file out the slots a bit as well. The spokes from my servo mount were a little large, so I filed those down too. Overall, it wasn't too tough to fit everything together. When I build another one, I need to see if my problems were caused by the STL files, how the G-Code was generated or the calibration of the printer itself. The local RC shop called Hobby People had most of the small and moving parts. Servos, ball joints and such came in at under $30. Lowe's had the right sized all-thread to finish the job. One thing about the construction was that I originally bought 10mm hex cap screws to join the ball joints to the biceps. The way the bicep is built, though, the joint tends to hit the side of the bicep and limit the range of the effector. To solve this, I moved the ball joints outward with small washers. This made the 10mm hex caps too short, so I went with 15's instead. Redesigning the bicep to free up movement might resolve this problem. I slipped a metal stylus pen through a rubber grommet and effector. The stylus was grounded with an alligator clip onto the breadboard. The rest of the robot (as you can see in the pic) are an Arduino Uno, a small breadboard and a four-legged stand I put together from a 1x2 and some angle braces. The robot is held to the frame by a fender washer through the central hole of the mounting bracket. The sketch had to be modified with the correct measurements on the actual robot. Most everything matched, so that built my confidence. Once I uploaded the sketch, I played around with the machine code and made it dance. This is when I found out the ball joints were binding against the bicep. I also dropped the robot, and the short hex caps made it go eveywhere. D'oh! I forked and cloned Justin's github to prep for writing some code and tidying up the notes. Rather than cracking phone PINs, I plan to use this to punch card PINs on PIN Pads used in credit card processing. I don't think I'll need the OpenCV code, so I'll have a blind version of R2B2 up in my own repository once I learn enough Python to be dangerous. Finally, Marginally Clever has a new version of the delta bot that uses laser cut parts. The R2B2 that Justin demoed at SXSW seems to have been made from this version out of acrylic. Snazzy! This comes with its own platen and looks mighty sturdy. I might have to grab one and give it a spin. 6 $1.04 The Hillman Group 44817 8-32 x 6-Inch Threaded Rod, 10-Pack Threaded rod for ball joints to connect bicep to effector. As needed Varies Washers,Flat,3mm DUB2109 and The Hillman Group 36-Count #6 x 3/8-in Zinc Plated Standard (SAE) Flat Washer Washers to separate arm from bicep and effector. Used to give arms maximum freedom.